Jean-Pierre Lacroix, Under-Secretary-General for Peacekeeping Operations, addresses the Security Council meeting on the situation in Haiti. The United Nations has already started to prepare for a post-peacekeeping presence in Haiti, a senior UN official said Tuesday, stressing there are many reasons to be optimistic that the country’s progress towards stability is now irreversible. “While achieving results should remain our common priority, we have already started to prepare for a transition to a non-peacekeeping presence, based on lessons learned in Haiti and in other contexts,” the Under-Secretary-General for Peacekeeping Operations, Jean-Pierre Lacroix, told the Security Council. He said that in the coming months, his office will provide progress assessments to allow the 15-member body to take well-informed decisions for the drawdown and eventual withdrawal of the UN Mission for Justice Support in Haiti (MINUJUSTH). Established in October last year, MINUJUSTH replaced UN Stabilization Mission, which operated in the tiny island nation for 13 years. Much smaller than its predecessor, which had more than 4,000 military and police personnel, MINUJUSTH assists Haiti to further develop national police, strengthen rule of law institutions and promote and protect human rights. While the Security Council is expected to renew MINUJUSTH, whose initial mandate expires on 15 April 2018, Mr. Lacroix said the UN is determined to ensure it be the last peacekeeping operation deployed to Haiti. Last month, UN released a strategic assessment of MINUJUSTH, including 11 benchmarks for a smooth transition to a non-peacekeeping presence by the last quarter of 2019. “Haiti has come a long way to achieve the relative political and security stability it is now enjoying, but persistent economic uncertainties, which can result in social exclusion, particularly of youth and the most vulnerable, may undermine this progress,” said Mr. Lacroix. In mid March, he visited Haiti for the first time since taking office a year ago. He said that MINUJUSTH is fully operational and actively implementing its mandate. For instance, the Mission has co-located 135 individual police officers with the Haitian National Police (HNP) in each of Haiti’s 10 departments, and it is dedicated to helping curb prolonged pretrial detention and prison overcrowding through on-site monitoring. The weaknesses of the rule of law institutions continue to generate multiple human rights challenges and encourage a culture of impunity, he said, noting that priorities in this domain include the need to strengthen national human rights institutions. Acknowledging there could have been a misunderstanding between the UN peacekeeping mission and the Government of Haiti, he welcomed the most recent announcement by the country’s President of his priorities on reform, including the strengthening of the justice system and national police, the fight against impunity and prolonged pre-trial detention, the fight against and prevention of corruption, the establishment of the Permanent Electoral Council, and the launching of a national dialogue. 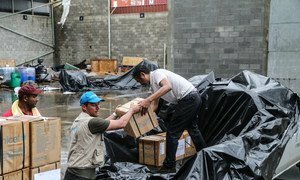 Despite a massive humanitarian effort over the past six months in the Eastern Caribbean, Cuba and Haiti, there is still much work to be done to rehabilitate water and sanitation and other infrastructure damaged by powerful hurricanes Irma and Maria, the United Nations Children’s Fund (UNICEF) reported on Tuesday.